Location: Set back from the road in gardens, east of the Church of Saint Catherine. Dated 1884, and probably designed by John Douglas, architect, Chester. Now divided into flats. Free-style house, drawing on Tudor Gothic and Vernacular sources. Knapped stonework using stones of different colours to stress the different storeys, and to create a diaper-work pattern in the upper storey. Grey stone plinth and ashlar dressings including angle quoins. Slate roof with end and axial stacks. 2 storeys with attics. Entrance in E gable return, and main elevation facing S over the garden. This S elevation has a 2-storeyed canted bay window with hipped roof to the left, with French doorway on inner face, 4-light mullioned and transomed window to ground floor, and 3-light mullioned window above. A verandah adjoins this bay and runs across part of the rest of the facade. 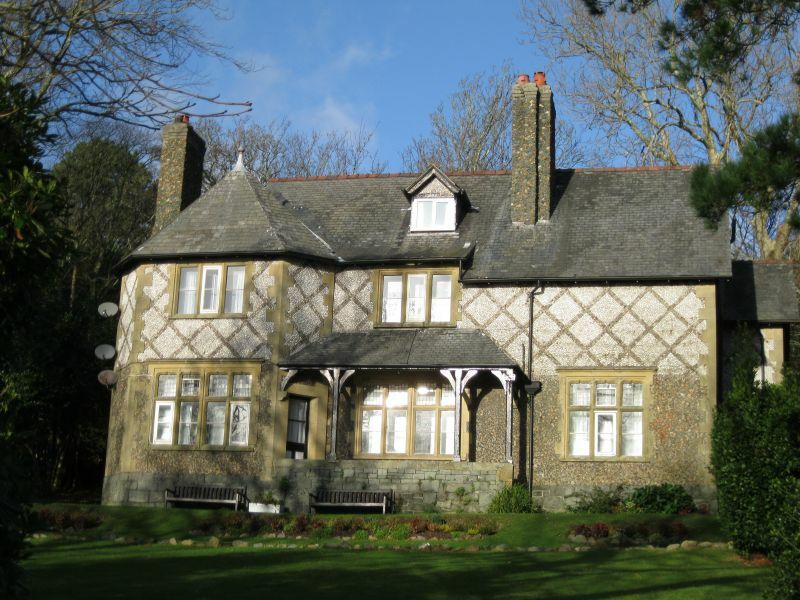 It has chamfered timber columns and curved struts carrying slate roof. Behind the verandah, a 4-light mullioned and transomed window, and a 3-light mullioned window above, the roofline pushed up over it slightly. Gabled dormer in the roof above. 3-light mullioned and transomed window to right of verandah. All the transomed windows have ogivally arched heads to upper lights, with decorative leading in the upper panes. Entrance front has advanced porch gable offset to the right, the slope of its roof exactly echoing the rear slope of the main roof. A strong moulded cornice above the entrance stresses its division into 2 storeys, with diaper-work in the upper storey. Moulded stone doorcase has blind ogee panels in the lintel, with date carved in centre. 2-light mullioned window above the doorway, and 3-light mullioned window at first floor in main gable of house, with attic window in gable apex. Small service yard enclosed by a wall in the angle of the main range of the house with its rear wing, at the NE. A Striking example of a free-style house, which is especially notable for its decorative use of local materials. To the east of the house at Bryn Hir, close to Lon Ednyfed.